Concerns over damage to vegetation have the state taking flight to cull the goat population in the Waianae mountains. 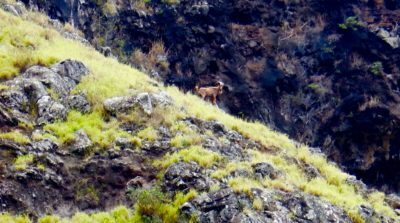 Leeward Coast hunters fear that a traditional source of sustenance may be lost due to an effort by the Department of Land and Natural Resources to restore watersheds through aerial shooting of feral goats in the Waianae mountains. Aerial shooting of feral goats by the DLNR began last year and has happened twice. According to a video made by the agency, the goats damage vegetation, diminish water-carrying capacity, erode soil and spread non-native weeds. 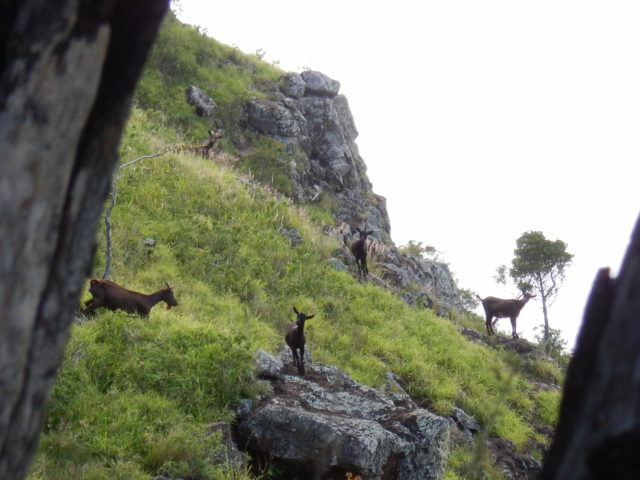 Goats in the Waianae range are a source of game for local hunters but a threat to the watershed for a state conservation agency. Many hunters are opposed to these shoots and say they are taking place without their input. But Department of Forestry and Wildlife program manager Ryan Peralta said that watershed restoration is a necessity and there has been plenty of public outreach. The state even makes goat carcasses available for harvesting after the aerial shoots, Peralta said. Stakeholders will meet with state Rep. Andria Tupola on Wednesday at Ka Waihona O Ka Na’auao Elementary School in Nanakuli at 6 p.m. to discuss the dispute and search for ways that the DLNR and hunters can more smoothly co-exist. Waianae resident James Manaku Sr. has been using goats as a food source for more than 50 years. He says that practically all parts of the goat are eaten — even the skin, which can be fried. He’s not happy that the state is shooting goats from the air. Michael Eli, vice president of the Waianae Hunting Association, said about 200 people living in Makaha and Waianae utilize goat meat. On a good hunt, he may be able to carry as many as four goats off the mountain. It’s uncertain how many goats are living in the Waianaes. Aerial surveys by DLNR of two out of six areas in the Waianaes found 380 goats in March 2017 and 228 in November. The Honolulu Board of Water Supply has worked with the Oahu Army Natural Resource Program, Waianae Mountains Watershed Partnership and DLNR to focus on fire protection, weed control, ungulate control and the planting of native plants to enhance rainfall capture and aquifer recharge in Waianae watersheds, particularly in Makaha and Waianae Kai. Nine valleys are included in the Waianae Watershed Restoration Plan. 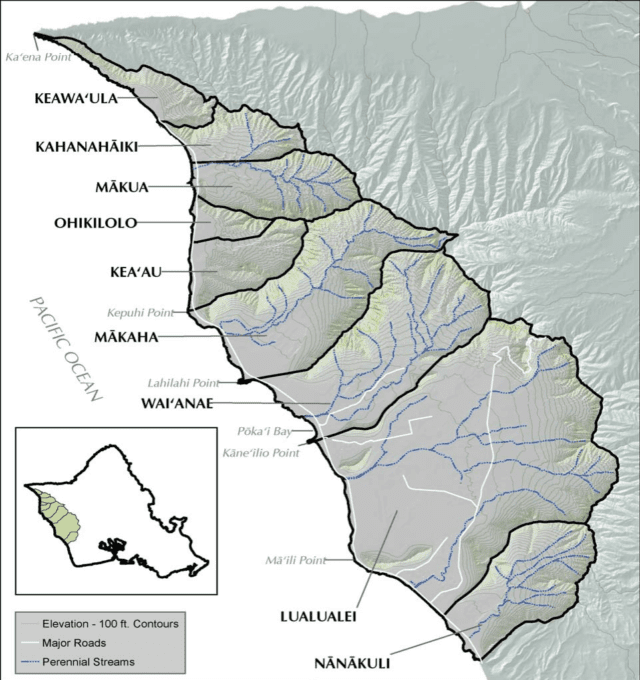 The resulting Waianae Watershed Management Plan stretches from Nanakuli to Kaena Point and seeks to restore and preserve the watersheds and provide sustainable water supplies. Open land in Makaha is owned by BWS. The forested area in Waianae is under DLNR jurisdiction. Goats have lived in the Hawaiian Islands since they were introduced by explorers at the end of the 18th century. There are records of National Park Service workers shooting feral goats from helicopters in Hawaii Volcanoes National Park in the 1970s. In the 1990s, goat populations were eradicated on Lanai and Kahoolawe. On Lanai, hunting efforts and fencing off of vegetation were started by Charles Gay, who owned much of the island in the 1900s. Kahoolawe goats were wiped out by the U.S. Navy through ground hunts and aerial shooting before it returned ownership of the island to the state. It’s uncertain how many goats are living in the Waianaes, but they number in the hundreds. Due to the destructive nature of ungulates on Mauna Kea, aerial shooting by DLNR was approved by a federal judge to eradicate sheep in 1998 and occurred two times a year until 2012. Eradication of goats in the Makua Military Reservation, an area just west of Makaha within the boundaries of the Waianae Watershed Management Plan, was completed through the Oahu Army Natural Resource Program in 2004. Aerial shooting was one of the methods used. Prior to 2016, state law prohibited aerial shootings of animals. An amendment to the Uniform Aeronautics Act in 2016 exempted state employees and those contracted by the state from this rule. Due to the hazardous conditions on mountain slopes, the DLNR determined that aerial shooting is the most cost effective and efficient option for ungulate management. BWS feels that control efforts will be best managed by DLNR. Hawaii Hunting Association Chairman Tom Lodge expressed his frustration and concern about the aerial shooting of goats. Peralta said “eradication” is not the objective in the state’s latest aerial shooting program. While eradication of goats would allow vegetation to recover quicker and more effectively, the populations are instead being culled in effort to balance hunting opportunities with providing clean water, he said. In 2015, the Game Management Advisory Commission was created to advise the Board of Land and Natural Resources. Lori Buchanan, vice chair of the commission, believes that more information is necessary before preceding with additional aerial shooting. She said no environmental assessments have been conducted. Buchanan penned a commission letter in August asking for the shooting to be put on hold until more information was available. Peralta says community outreach started in February 2017 and consisted of public legal notices, an informational video, press releases and talks with legislators, the GMAC, the Nanakuli and Waianae neighborhood boards and other organizations. But Waianae Neighborhood Board member Kellen Smith says the board didn’t receive a letter of notification until the plan had already been implemented. Hunters are hoping to get a signed agreement that no aerial shooting will take place in red and blue circled areas. 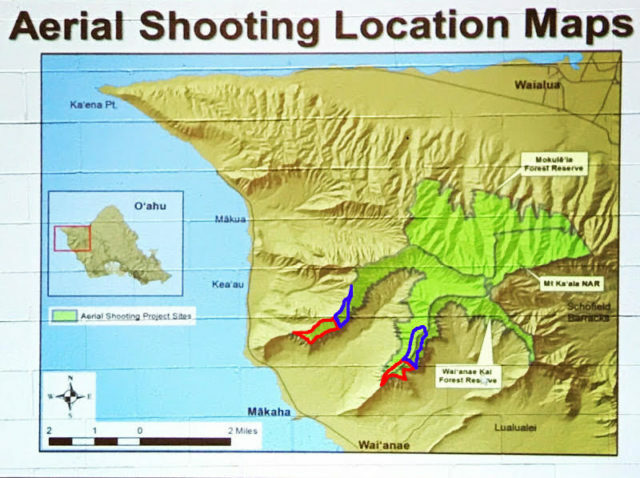 Members of the Waianae Hunting Association have asked for additional access points (marked entrances), and that aerial shoots be stopped in potentially accessible parts of the Waianae Forest Reserve and Makaha ridge. According to Peralta, additional access points have been created and marked. Permits have been made available for people wishing to collect carcasses after aerial shootings. People wanting to collect more than the daily two-goat limit can also request a special permit. He says that the DLNR is also working with the Board of Water Supply to give hunters access to Makaha ridge. Katie Boon is a Civil Beat intern and a junior at the University of Hawaii Manoa.